Tis’ the season, deck the halls and be merry!!! It’s that time of year again and with the holidays comes time to bake ALL THE COOKIES! Right about now my kitchen is a royal disaster 90% of the day…cooking + baking + chasing the little light our day sheds on us. Anyone else with me??? I’m currently staring at my disaster as I type this. I know, I should clean up before I write this, but then you wouldn’t have this spectacular recipe!!! And don’t you want to bake? Like right now? So, here I am, writing this to you, ignoring my kitchen but it’s worth it. And yes, I kicked my kids outside in the cold because they need it, so peace and quite for about 20 more minutes. 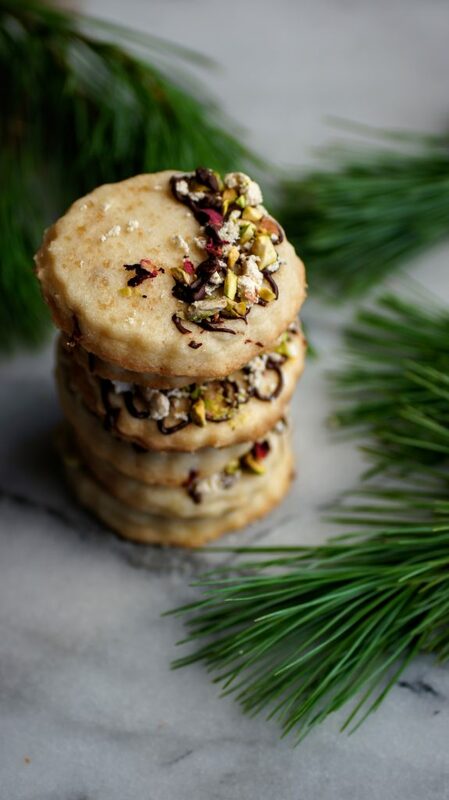 Most Lebanese desserts are very time consuming and labor intensive, so I wanted to create a cookie that not only tasted good but was easy and filled with some of the Lebanese flavor we all love. 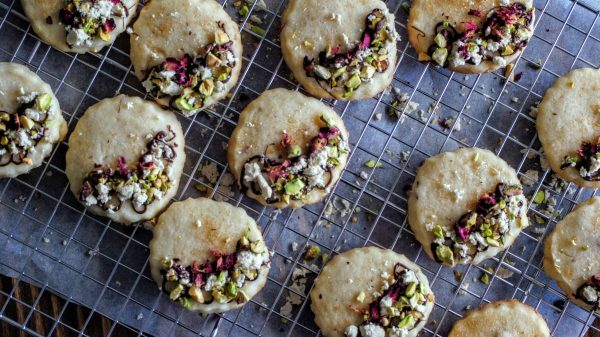 Enter these amazing shortbread cookies! The base recipe is my go-to recipe from the incredible Ina Garten. Simple ingredients of butter + flour + sugar and salt make these delicious treats. I added some dried rose petals to the dough as well as orange blossom and rose waters in lieu of vanilla extract. 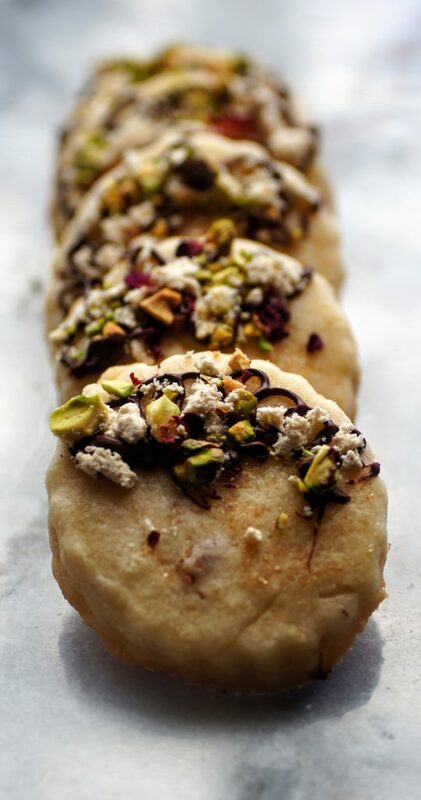 Just hints of these waters really give the cookies an subtle distinctive flavor, nothing too overpowering and are the essence of any Lebanese dessert. Keeping this short and sweet while I head off to clean the disaster and wait for some child to torture the other child and start yelling (I’m an awesome mom aren’t I?) Now go bake and enjoy! As always, I love seeing your creations, be sure to tag me on Instagram @CosettesKitchen or post on my Facebook Page. In the bowl of a mixer fitted with paddle attachment, mix together butter and sugar. Add in your orange blossom and rose waters. Slowly add in your flour, salt and 1 tbsp chopped dried rose petals. Mix on low until combined and dough comes together. Dump dough on surface with a bit of flour and shape into a disc. Wrap in plastic wrap and chill for 30 minutes while your oven preheats. Remove dough from fridge and roll about 1/2 inch thick. Using a cookie cutter, begin cutting as many as you can. **Reroll dough and cut again until you are finished with your dough, be sure to work quickly. Place cookies on ungreased cookie sheet (you may use parchment if you'd like but not necessary). Sprinkle tops of cookies with coarse raw sugar. Bake for 20-25 minutes on upper 1/3 of oven until edges begin to brown slightly. Swap trays halfway through. Heat your chocolate in a microwave safe bowl in 30 second spurts. Check and stir until chocolate is just melted. Using a small baggie with a tiny hole cut in corner or a piping bag with small hole, fill chocolate and drizzle one side with chocolate. Quickly sprinkle some halawa, chopped pistachio and rose petals. **2" cookie cutter was used to yield about 36 cookies. You may choose to use a large cutter for larger traditional shortbread size and shaped cookies. 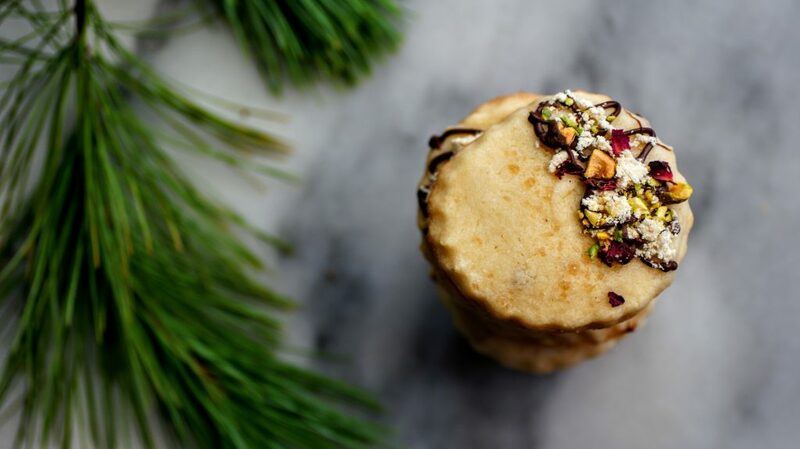 **Undecorated cookies can easily be frozen for several months as well as raw cookie dough.